U.S.A. OWNED award winning antivirus software. Founded in 1997 in Boulder Colorado. 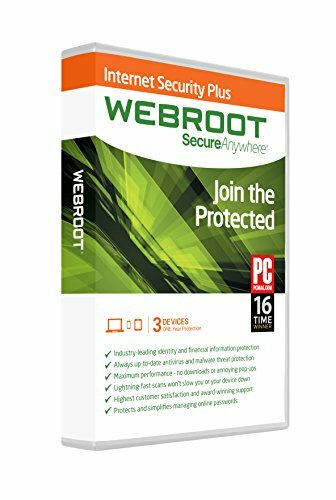 Webroot SecureAnywhere Internet Security Plus provides cloud based protection from online threats for PCs, Macs, Android and iOS smartphones and tablets keeping you safe no matter how or where you connect. It scans faster, uses fewer system resources, and protects you in real time by instantly identifying and blocking new threats as soon as they appear. Webroot Internet Security Plus identifies unsafe links and search results before you click, protects and manages your passwords and logins, and pre fills online forms. Mobile security ensures you are protected from malicious apps and syncs online passwords across all your devices so they are accessible anywhere.